Think with me for a minute… A pastor touches 5,000 people each week in a country where churches average 27 in attendance! That’s just what Rob Flaherty does with humorous, biblical and practical YouTube videos. The videos are never more than six minutes long. He has a huge following which he uses to change lives and plant churches. This, along with uploaded sermons allows him and his team to launch house churches across the country–for very little money. When we hung out for several hours a few weeks ago, he taught me a lot about grabbing oppportunities. 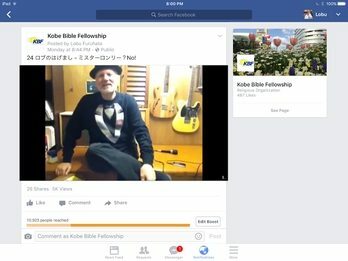 (helped launch the Kobe Bible Fellowship 26 years ago). Found the church young, vibrant and overflowing with people of all ages. Best is the fact that they still want to change the history of Japan. They’re doing it with simple technology. I am amazed at the creativity of that congregation and they have me wanting to pursue different avenues of communication, so look for new stuff on this website in the near future. Why Waste The Time Writing A Church Planter’s Blog?